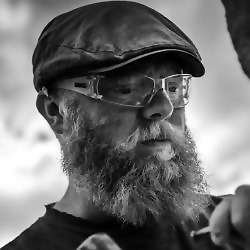 Hello there, My name is Steve Roche, I am a Letter Carver and Stonemason specialising in handmade inscriptions and traditional masonry techniques. My work ranges from formal hand-cut memorials, to restoration of old buildings to public art projects. My main passion is designing inscriptions and cutting letters in stone. I have just completed the three year calligraphy course the Advanced Training Scheme run by the Society of Scribes and Illuminators. The ATS has given my creative development as a Letter Carver a real boost, I now have a number of new strings to my bow and a feeling of genuine creative flourishing. It has led me to produce large contemporary calligraphy pieces in scripts I have developed myself. Over the last few years I have been commissioned to do a number of public art projects: - a 12 ton Yorkstone boulder with a stags head pattern motif. - turning local peoples thumbprints into geometric labyrinths cut in stone. - a fossil-limestone boulder with a sycamore seed carved in the top and a poem spiralling round in the motion of the seed. I set up The Stone & Letter Workshop in 2013 at Stag Works nr Bramall Lane in Sheffield. Pop in if you're passing by!